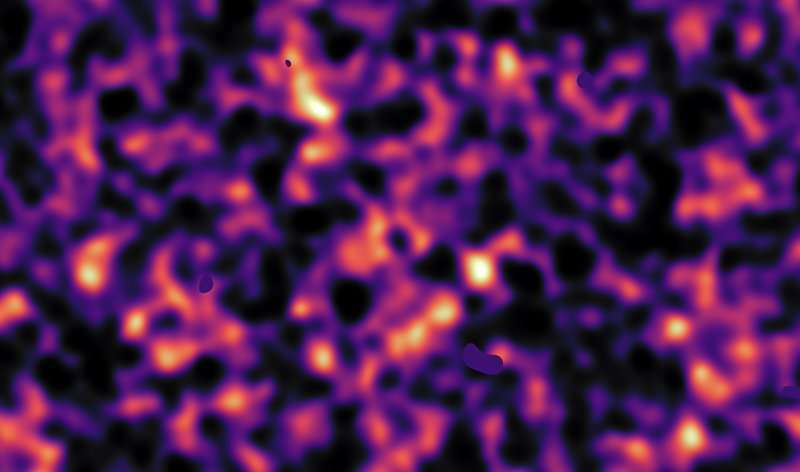 The unveiling this summer of the most accurate cosmic picture ever taken of the distribution of dark matter has left astrophysicists feeling both delighted and frustrated. On the one hand, the new picture—taken of the "grown-up" universe, over the latter half of its 13.8-billion-year history—closely agrees with the "baby" pictures separately taken in recent years. On the other hand, this agreement leaves little room for the discovery of new physics that could reveal the identity of dark matter and an even more mysterious phenomenon, dark energy. Three researchers recently participated in a roundtable discussion, hosted by The Kavli Foundation, about the new results and their implications for understanding the universe's history. "We're all astonished that these two pictures [of the early and modern universe] agree to the extent they do," says cosmologist Scott Dodelson, one of the lead scientists behind the new Dark Energy Survey results and chair of the Department of Physics at Carnegie Mellon University. He formerly worked at the Fermi National Accelerator Laboratory and was affiliated with the Kavli Institute for Cosmological Physics at the University of Chicago. The new findings, released in August 2017, strongly support the standard model of Big Bang cosmology. According to this framework, the universe is mostly "dark," composed of unseen substances that, for the most part, do not interact with the "normal" matter that composes people, planets and stars. The results showed that dark matter makes up 26 to 27 percent of the universe's contents; dark energy, a force that is accelerating the universe's expansion, is the lion's share at around 70 percent; and, normal matter is a mere 4 to 5 percent of the total. "Forty years ago, nobody would've guessed that we apparently live in a universe in which most of the matter is stuff that doesn't interact with us, and most of the energy is not even matter! It's still super mind-blowing," says Risa Wechsler, an associate professor of physics at Stanford University and the SLAC National Accelerator Laboratory, as well as a member of the Kavli Institute for Particle Astrophysics and Cosmology. Wechsler is a founder of the Dark Energy Survey, which uses a telescope in South America to observe millions of galaxies and infer the dark matter distributions around them. As well-tested as standard model of Big Bang cosmology is, the identity of dark matter and dark energy remain elusive. Many scientists are holding out hope that new observations, such as those released in August, will offer clues about what lies beyond it, possibly forcing a radical rethink of existing theories. George Efstathiou, who contributes to the Dark Energy Survey, has served as a science team leader for the European Space Agency's Planck spacecraft. It was Planck that obtained the "baby" picture of universe between 2009 and 2013. "One of my hopes for Planck was that the standard model of cosmology would break and it didn't," says Efstathiou, who is a professor of astrophysics and the former director of the Kavli Institute for Cosmology at the University of Cambridge. "But wouldn't it be absolutely great for cosmology and for physics if this happened? So we should plug away and see. Maybe we'll be lucky." As Efstathiou suggests, the Dark Energy Survey may still lead to new insights. The new results are based on only the first year of the project's observations, which will wrap up next year after five years. All this new data "will enable us to hit the standard model of cosmology as hard as it's ever been hit," says Dodelson. And new projects are coming online in the 2020s that should vastly increase the scope and detail of cosmic structure maps and submit our current theories to even more rigorous tests. "My bet is that we're looking at things all wrong," says Dodelson. "Someone who's eight years old today is going to come around and figure out how to make sense of all the data without evoking mysterious new substances."